This past weekend, I had the pleasure of attending a workshop by Dr. Joe Dispenza—a thought leader who has had tremendous influence in how I think and live. 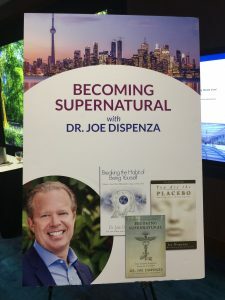 For the readers who are not familiar with Dr. Dispenza, he is an international lecturer, researcher, corporate consultant, author, and educator who is driven by the conviction that each of us has the potential for greatness and unlimited abilities. His work focuses on how we can rewire our brains and recondition our bodies to make lasting changes with conscious, intentional thought. For years, I have been a huge fan of his work and have read all three of his books: You Are The Placebo, Breaking The Habit of Being Yourself, and his most recent one, Becoming Supernatural—each of which has had a unique, scientific approach to explaining the power of consciousness. When I heard that HayHouse Publishing was having him present in Toronto this past long weekend, I had to jump on the opportunity! With over 1200 people in the room, Dr. Joe lead us through a staggering lecture about the power of intention and conscious thought, and I would like to share some of his key concepts with you today. Although mindfulness and meditation have been at the core of my self-care practices for much time now, the science of how these mental practices are able to alter our physical selves simply amazes me. The core premise of Dr. Joe’s work lays within the belief that conscious thought has the ability to shape our reality. Now, don’t let me lose you here. If you’re thinking, “Oh boy, Nathalie has gotten out there…”, let me ask you this. Have you ever thought back to a stressful situation and felt your heart rate go up and your palms start to get sweaty? Even though the scenario was playing in your mind and not in reality, you still had a physical reaction to it. So, if your thoughts are able to create an adverse physical reaction, wouldn’t they also be able to create a positive reaction, as well? Much of Dr. Joe’s work has focused on studying just that. Having healed himself from a horrific bike accident resulting in six broken vertebrae, he has partnered with other scientists to perform extensive research on the effects of meditation, including epigenetic testing, brain mapping with electroencephalograms (EEGs), and individual energy field testing with a gas discharge visualization (GDV) machine. His research also includes measuring both heart coherence with HeartMath monitors and the energy present in the workshop environment before, during, and after events with a GDV Sputnik sensor. Results show incredible improvements in genetic expression, brain wave activity, energy, telomere length and even heart rate variability. As he says in one of his audios, “All potential that exists in the quantum field exists in the present moment and all potentials that exist in the quantum field exist as potential electro-magnetically. Our job then is to change our energy to match those potential that already exist in the quantum field.” Now you may be thinking, how does a simple thought cause all of this? If we are more conscious or aware of ourselves and our environment, we are simply better attuned and more adaptive. If all that is true, then how do we best use our conscious ability to control and shape our thoughts and ultimately our lives? What questions allow us to reach and sustain greater levels of happiness and success? It all comes down to moving away from the fascination of how we are conscious into a focus of what we should be conscious of. If we could reprogram our minds to only be conscious of the needle movers that bring us joy, fulfillment, engagement, and transcendence, wouldn’t that almost guarantee us more success? This reprogramming isn’t just sci-fi talk. We now know that conscious thought quite literally can reshape our brains through a process called neuroplasticity. And it all begins with asking ourselves: Where shall I focus my thoughts right now? Ultimately, where you place your attention is where you place your energy, and where you place your energy is where manifestation happens. The work of Dr. Dispenza presents to us the idea of quieting our mind and our inner desire to control and direct every aspect of our lives, and rather allow our thoughts and visualizations tap into a universal intelligence that will help us accomplish and experience what we desire in life. If abundance already exists in the quantum field, which it does, then you have to change your state to match what is already out there to draw that experience to you. To do that, you have to have a clear intention and an elevated emotion that’s associated with that. Intentions and emotions move you into a new state of being, a new personality—which create a new personal reality—by “living” in the future with the emotion of how you would feel. By doing that, you are no longer training your brain and body to be defined by a memory of the past but to be defined as a vision of the future. Personally, this belief has not always been a part of me. For much time, I felt the urge to have to control and steer my life forcefully; but now, affirmations, visualizations, and deep meditations have become as important as my daily workouts. As Dr. Dispenza says, “Thoughts are the language of the brain and feelings are the language of the body, and how you think and how you feel creates a state of being. Thoughts are electric and feelings are magnetic, and when you change how you think and how you feel, you broadcast a new electromagnetic signature.” You become more energy and less matter. When we get to that place, we can have such a greater impact on our world. If you would like to learn more, pick up a copy of either of Dr. Dispenza’s books, I’m sure you won’t be disappointed. A challenge I also propose to you is to look into downloading his guided meditations and trying them out every day for 30 days, and seeing what potential you can tap into!